The quality of opponent made Saturday afternoon's first half a success for the Utah basketball team. 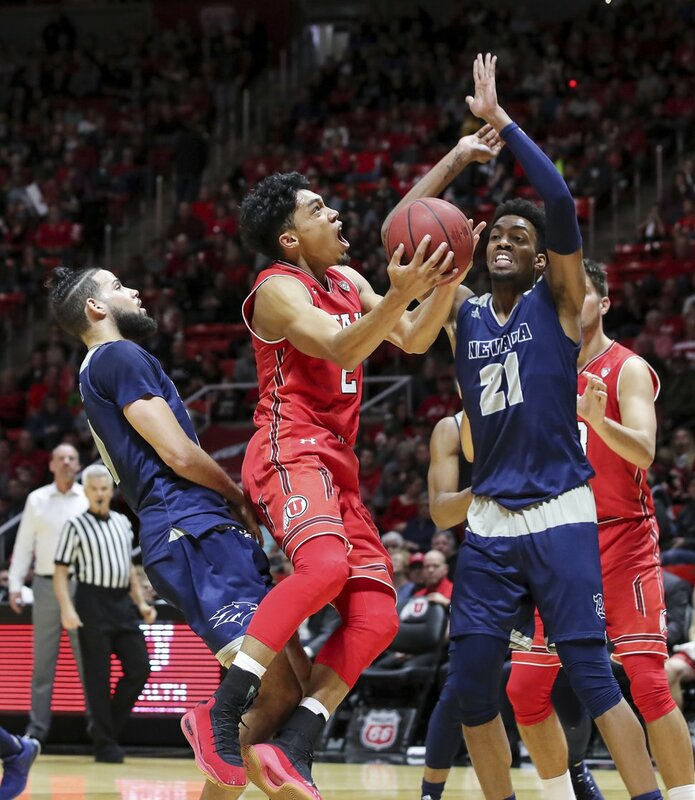 Utah battled defensively, Sedrick Barefield scored 19 points and the Utes trailed unbeaten Nevada by only one point, deserving to feel reasonably good about themselves. That's precisely the problem, as it turned out. The effort may have been too satisfying to the Utes, judging by what coach Larry Krystkowiak witnessed during the brief warmup period at halftime. The No. 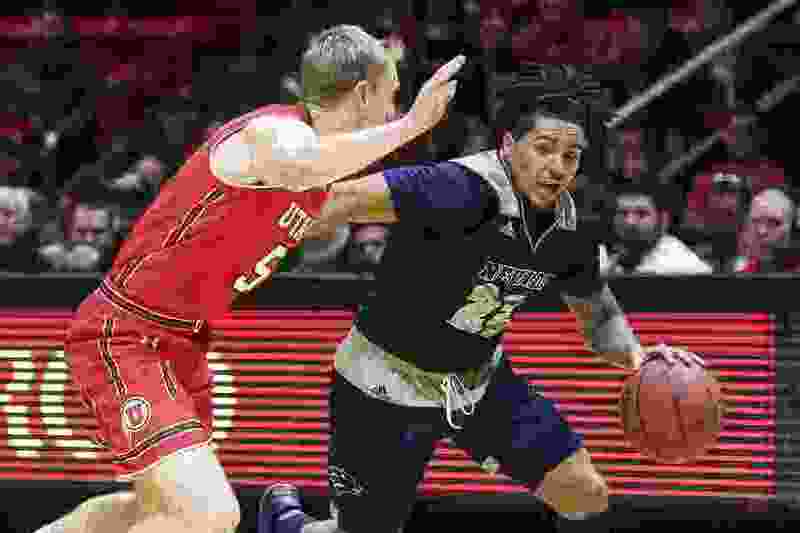 6 Wolf Pack took command in an eventual 86-71 victory at the Huntsman Center, as Nevada asserted itself and the Utes faded in a performance that Krystkowiak partly attributed to what happened before the second half actually started. Senior forward Caleb Martin scored Nevada’s first nine points of the half on his way to a 33-point day, and the Wolf Pack’s 13-3 opening run that stemmed from Utah’s five turnovers permanently altered the game. The Utes later cut the lead to 53-49 on a Barefield 3-pointer, part of his own 33-point showing, but Nevada responded again. • Nevada forward Caleb Martin makes 9 of 14 shots in the second half, scoring 25 of his 33 points in the Wolf Pack’s 86-71 victory over Utah. • Ute guard Sedrick Barefield goes 10 of 15 from the field, scoring 33 points, two short of his career high. • Utah is 6-6, the program’s first non-winning record prior to conference play since 2011-12, coach Larry Krystkowiak’s first season. And there went any chance for the Utes (6-6) to take major momentum into Pac-12 play, beginning Thursday at No. 17 Arizona State. “That’s just an elite team,” Krystkowiak said of Nevada. And later he said, due to his team's challenging schedule, “It's not going to be an out-of-body experience to look at those types of athletes and those programs” in the Pac-12. All of those statements are true, if mildly contradictory. What’s clear is the Utes have crumbled at some point in the second half of each of their six losses, when their offense went stale and their defense was not nearly good enough to sustain them. Krystkowiak pinpointed a “moment of truth” in each defeat, when the opponent seized control with key shots and defensive stops. Krystkowiak said before Thursday’s practice that with a softer nonconference schedule, Utah could have gone 10-2 and then he would have heard complaints about not challenging his team. The current reality is the Utes will have to overachieve in the Pac-12 just to have a winning record this season. Nevada shot 58.6 percent in the second half, after the Utes hounded the Wolf Pack with their aggressive zone defense in the first half. Martin started hitting from outside and the Utes' 11 turnovers in the second half kept them from setting their defense. Barefield was charged with five turnovers, and his brilliant shooting couldn't save Utah. At one point, he was 10 of 14 from the field and his teammates were 11 of 35. Nevada was just too good to allow Utah to generate any run that would have kept the crowd more engaged. The announced attendance was a season-high 12,835 — even during the campus holiday break, with few students in the building and the band not playing. The fans appreciated Utah’s first-half effort, but there never was a moment in the second half when the home team seemed capable of winning. And when the game ended, the piped-in fight song sounded rather hollow.